• You can also play DVD-R/RW, CD, CD-R/RW, MP3, WMA, AAC, JPEG and other formats. • Bluetooth connectivity and a USB port allow you to connect your device and play music. 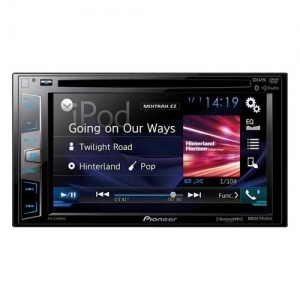 • Features the control and display functionality to support • • • SiriusXM Satellite Radio. Tuner and subscription required for activation (not included). • The AM/FM tuner can be preset to 24 different stations (6 AM, 18 FM). • Use the customizable EQ and EQ presets to get the perfect audio quality for your music. • Once you’ve connected your phone using the USB port, you can control the Pandora radio app right from your receiver. • Use the auxiliary input or the USB port to connect your device. The composite A/V input lets you connect an external component. Three RCA preouts (4V) are ready to connect your car speakers. • Apple, the Apple logo and iTunes are trademarks of Apple Computer, Inc., registered in the U.S. and other countries. iPod is a trademark of Apple Computer, Inc.